The origins of Lyme Regis go back to the 8th century, and the town was granted a royal charter (hence 'Regis') by Edward I in 1284. Lyme was an important port during the middle ages, and the unique 'Cobb' probably dates from the 13th century. This circular stone harbour was first mentioned in 1377, and was originally detached from the mainland although it is now connected by a causeway. 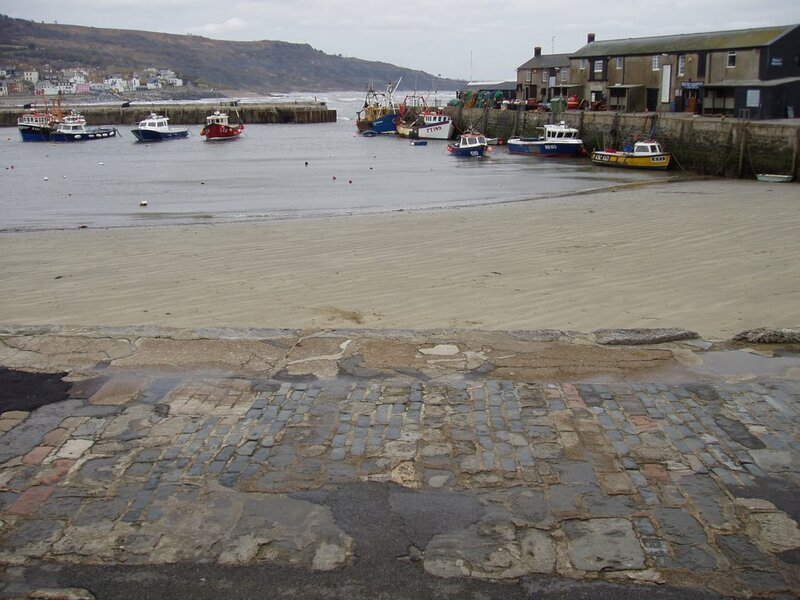 The Cobb formed the nucleus of an important port and shipbuilding centre, and was one of England's most important trading ports until well into the eighteenth century. View of the interior of the Cobb. 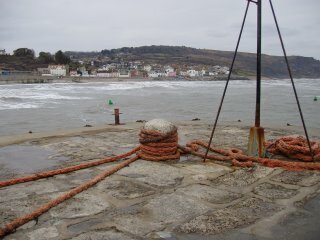 View of the town of Lyme from the end of the Cobb. Plaque commemorating the exploits of Sir George..
Elizabethan seafarer, politician and military leader. 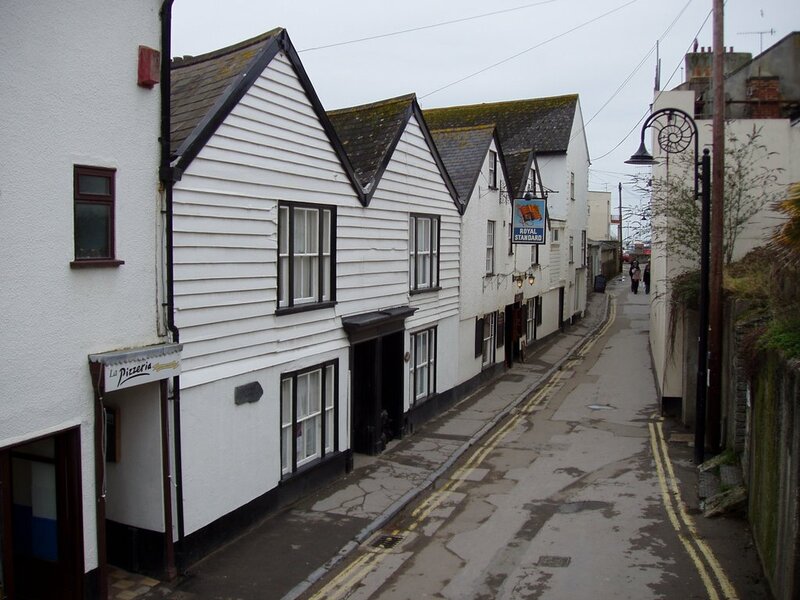 As a merchant trader he flourished in Lyme Regis. Warring with the Spanish increased his wealth. 1587 purchased Berne Manor, Whitchurch Canonicorum. 1588 prepared Dorset ships to repel the Spanish Armada in Lyme Regis, the Jacob, Revenge and Bonaventura. 1595 successfully attacked Caracas, Venezuela. 1601 repelled the Spanish invasion of Ireland. 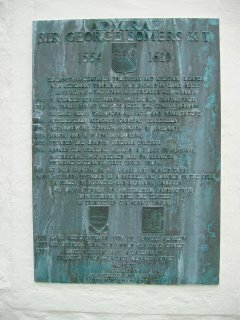 1604 Mayor and MP for Lyme Regis. 1606 founded the London Viginia Company. 1609 aboard Sea Venture he led a fleet to Virginia. A hurricane shipwrecked him on Bermuda, founding England's first Crown Colony. 1610 he died in Bermuda, his heart was buried there. A volley of muskets and a cannon saluted his last journey to Whitchurch Canonicorum. Shakespeare wrote The Tempest in tribute to Sir George Somers. 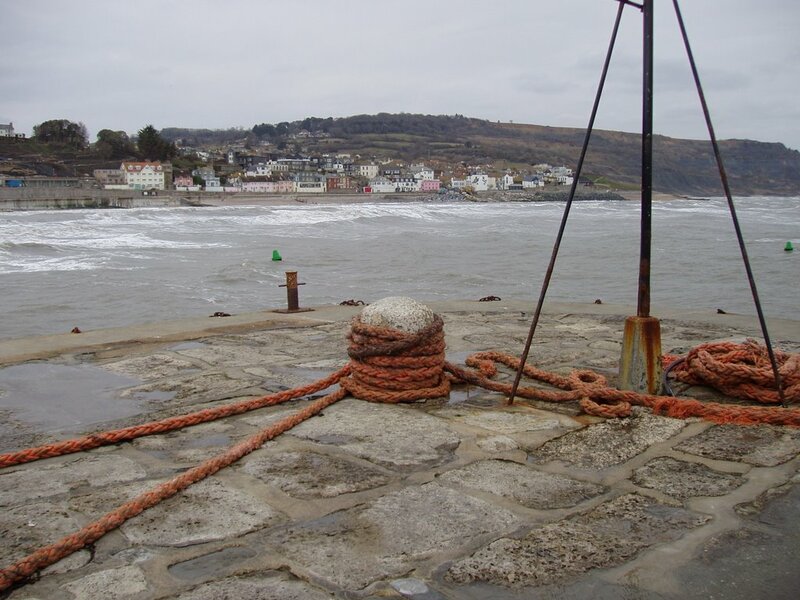 2001 Lyme Regis became a gateway to Dorset's World Heritage Jurassic Coast. Some of the older cottages in Lyme Regis.